To accomplish the numerous requirements of the clients, we are engaged in providing a high quality range of Homeopathic Sugar Globules. We are counted amongst the leading manufacturers, suppliers and exporters of Sugar Globules that are ideal to be used in various food and Nutracitical product. Our Sugar Globules are made using the best grade ingredients under the hygienic conditions ensuring their optimum quality. 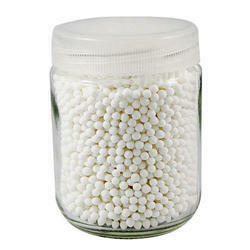 Our company also presents hand made Sugar Globules that have different medicinal formulations inside the pellets. These are available in bottles or any other packaging as per the requirement of the customers. Non Medicated Globules made from sulphur less pure cane sugar. Available in all size viz. 10, 15, 20, 25, 30, 35, 40, 50 & 60. Sparkling white in colour. High level of absorption without change in texture. Light weight having no crystal inside. Star Globules & Diskettes are made from Pure Sulpharless Sugar without additives & so it remain pure, non medicated and make a Homeopath assure for right medication and avoid unwanted results. Globules are white, round and uniform. The absorption of globules is unique one can see the dissolution which is also very fast. 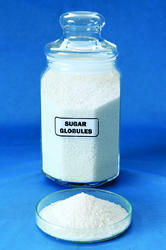 Cane Sugar Globules & Disketes with all sizes as 10, 20, 25, 30, 35, 40, 45, 50, 60 no. Sugar Spheres/ Pallets: We manufacture sugar globules with high purity and with latest technology.